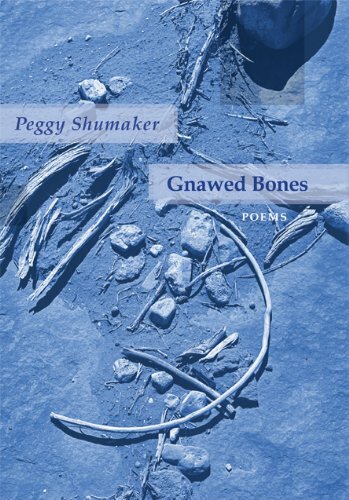 From wildfire and war to bleached reefs and human frailty, Peggy Shumaker's new poems meditate on mortality. Her poems speak with elegiac force for lost languages, lost ancestors, lost ways of being. This work sharpens the edges of our perception, drawing on the inner life, on secrets that keep us alive. With language as lyrical as the natural world, the poems in Gnawed Bones nourish us. Peggy Shumaker was born in La Mesa, California, and grew up in Tucson, Arizona. She earned her BA in English and MFA in creative writing from the University of Arizona. Shumaker was writer-in-residence for the Arizona Commission on the Arts, working with prison inmates, honors students, gang members, deaf adults, teen parents, little kids, library patrons, and elderly folks. She has given readings in art galleries, a governor's mansion, a clearing in the woods, an abandoned bank, on reservations, in libraries, at a gold dredge, under the hoodoos at Bryce Canyon, on a riverboat, and at many bookstores, community centers, and universities. Shumaker won a poetry fellowship from the National Endowment for the Arts and several awards for teaching. She served as poet-in-residence at the Stadler Center for Poetry at Bucknell University and as president of the Board of Directors of the Associated Writing Programs. Professor emerita from University of Alaska Fairbanks, Shumaker was chair of the English department and director of the MFA program in creative writing. She currently teaches in the Low-Residency Rainier Writing Workshop. Peggy Shumaker and her husband, Joe Usibelli, live in Fairbanks, Alaska, and travel widely. Shumaker is founding editor of Boreal Books, an imprint of Red Hen Press, which publishes literature and fine art from Alaska. www.borealbooks.org.